Ahh...That bean bag is famous! Celebrities with our bean bags include Walt Disney, Saturday Night Live, Google, The Smithsonian, GQ Magazine, Modern Bride Magazine, Jim Henson Co. (Muppets), Hilary Duff, Ted Nugent, Washington Post, WB TV Network, Hanes Underwear, Pepsi, John Travolta + Kelly Preston, Kid Rock, 3 Doors Down, Macy Gray, Pink, Smothers Brothers, Metallica, and Jessica Alba. Read testimonials from non-Celebs too! Please join our bean bag bunch of satisfied customers...including interior designers, architects, celebrities, event planners, corporations, libraries, hotels, hospitals, theatres, music production firms, parks, schools, and folks like you! Featured on NBC's 'Live with Aaron and Kelly' - click to watch! How COOL is Kelly V. Dolan?! This amazing TV and Film actress not only did a radio show about our bean bags, she also donated LiL Me bean bags at a red carpet Alegria Magazine event benefiting Project Hope Alliance, to end homelessness, one child at a time! Yes, Late Night with Jimmy Fallon featured our Ahh bean bag chair in a Jersey Shore skit ("Jersey Floor") LOL! Our burgundy fleece bean bag had Jimmy Fallon's bum on it! Walt Disney Imaginarium ordered a bunch of Ahh bean bags! They are the creative force behind the design and build of all Walt Disney parks and resorts, attractions, cruise ships, & real estate developments. Ahh beanbags are the one and only official bean bag chairs at Rock on the Range USA, Rock on the Range Canada, and PointFest! These are huge rock concerts that are anticipated by the world every year. Artists such as Korn, Motley Crue, Hooberstank, and many more perform live for audiences of over 50,000 fans. Our bean bags will be backstage at the private artists' lounge where every performer will chill out before and after their show. Saturday Night Live! See our cuddle soft bean bag on Dec. 6, 2008, in a hilarious skit with John Malkovich and the SNL crew. 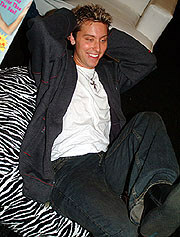 At the American Music Awards, Lance Bass of Superstar pop group INSYNC relaxed on our bean bag backstage! He ordered one later that week after telling people he LOVED our bean bags! As seen at the Annual American Music Awards! Here, Sean Paul is seen relaxing in our "Downtown" bean bag backstage. Sean Paul is a Grammy-winning reggae/dancehall music Superstar, with huge hits like "Get Busy" and Beyonce's "Baby Boy" featuring Sean Paul! A world reknown fashion and home designer (prefers to remain nameless) bought 6 more bean bags - this time it's for her vacation home! Apparently she "loves her bean bags"! Update: 8 more ordered, that makes 20! She's outfitting her entire vacation home "compound"! Update: special order for a shindig in the Hamptons, NY. A celebrity pro baseball player specifically requested our giant Chocolate Faux Suede bean bag! In his words: "A piece of furniture that you must experience for yourself! It's the perfect gaming chair! The thing that separates AHH! Bean Bag chairs from any other bean bag is its comfort and versatility. It's a place of relaxation and will hold perfect form whenever I want to sit up straight." Bevery Hills Sports Council, a pro-baseball player representation firm, requested our Ahh bean bags for their clients! They are big name agents who represent big name players! Our partnership is expected to be very long term! Relax in our Ahh bean bags at a beachfront resort in Maryland! 20 Ahh bean bags furnish the cool Planetarium at the Stafford Air & Space Museum in Weathorford, OK! Our bean bag cover was in a photo-shoot for the April 08 Martha Stewart Living Publication "Body + Soul"! If you're in the Residence Inn by Marriott Hotels in Bellevue, WA, look for our bean bags! Add GQ magazine to the list of Ahh bean bag owners! Add Cirque du Soleil, Las Vegas, to our distinguished client list! Our virgin bead filling will star in an Animal Collective music video! Our natural cotton bean bags star in "The Union", a documentary film hopefully headed for Sundance Film Festival! Happen to be staying at the Saint Regis Deer Crest Resort in Park City, UT? Look for our bean bags! A bunch of Ahh bean bag chairs for use at The Museum at Bethel Woods, New York. It's a state-of-the-art performing arts center located at the site of the 1969 Woodstock festival! We've outfitted one of the worlds most beautiful luxury super yachts: the 230 foot M/Y Reverie! You'll find our bean bag products at The Jewish Museum in New York! Update: They've ordered again! Ahh bean bags are at the Royal St. Kitts Golf Club in St Kitts! Lucky bean bags, we're jealous! The Field Museum of Chicago is also a client! Smart people like Ahh beanbags! Find our bean bags at MIT, Cambridge, MA! Our products are at the Jet Propulsion Laboratory at NASA too! Find our bean bags in The Minnesota Children's Museum. Update: They've ordered again! Ladco, Houston TX's largest design center, displays our custom bean bags made from their designer fabric! Ahh bean bags are in the Miami, FL Marriott's childrens room! ...and the Marriott's luxury resort in Aruba! BP, one of the largest energy providers, is using our bean bags for team building! We're proud that the United Cerebral Palsy Foundation is a client! Google now has our bean bags, in Google colors of course! Our bean bag will be featured at a black-tie gala on January 2007 for the Juvenile Diabetes Research Foundation. COSAC, the Center of Outreach Services for the Autism Community, is a non-profit organization founded in 1965 that provides services, advocacy, and family and professional education and consultation. It is the largest network of parents and professionals concerned with Autism in New Jersey. We're proud to have donated to help raise funds. Just shipped an Ahh bean bag destined for the US Embassy in Beijing China! WMHT, a well-known and respected PBS TV Station in New York is featuring our bean bags in their "Live TV Holiday Event" and their "Great TV Auction" event. We are their exclusive bean bag company! Our virgin beads are being used on the hit TV show "LOST"! Man, we love that show! They sent us photos of what the beads are being used for, but we aren't allowed to share...sorry! (hint: think Hurley's stunt double). From the costume supervisor: "It was a pleasure doing business with you last week. I really appreciate you going above and beyond the call of duty for us. Enclosed is something that I hope will make your day! Thanks again for your excellent customer service! Peace & Blessings." Pulte Homes, leading home builder, is putting our Ahh bean bags in their model homes nationwide...they know what will help them sell upscale houses! Ahh bean bag chairs star in new TV series Adina's Deck. 4 AHH beanbagss will play a role on the TV reality show on TLC "Tuckerville"! From the producer: "Bean bags were perfect and if at all possible I will let you know when the show(s) air. It will probably be early next week when I get back to you as we have many visiting producers this week along with the publicity crew from TLC. Thank you again so much!!" -P.C. You'll see our bean bags in an upcoming special on the Discovery Channel - showtime to be announced! PEPSI ordered our bean bags for a Pepsi One event in New York City! Update: more Pepsi bean bags were ordered! Hilary Duff, actress extraordinaire, just got a bean bag chair for her teeny chihuahua! From a world-reknown hospital: "We recently ordered a sample bean bag from your company. We have had our Infection Control staff review the data and perform their own inspections on your product. I am pleased to announce that your bean bag product has won the approval for use within our institution. Our patient population is primarily oncology based so we have stringent guidelines in place to insure the safety of our patients. I have located a group of donors who are interested in purchasing this product for use in various areas of our hospital. Thanks in advance for your help and I look forward to placing an order in early 2005. Happy Holidays". Update1: They ordered 14 beanbags and are ordering more to come! Update2: They say "We are absolutely loving the bean bags. They are everything you promised and more!...We are currently "looking" for a donor to assist us in purchasing additional bags for other areas of the hospital. Thanks" Update3: They came back again to say "We have to wash them by color because the children won't let us take too many away at one time!" (they have many bean bags in various colors). Update4: Even MORE bean bags ordered! Update5: A new building will be furnished with AHH bean bag chairs! Yes, we're on TV again! See our bean bags on HGTV's "Designers' Challenge" on January 4 & 5, 2005. We'll be featured in the room designed by the fabulous Jeanese Rowell Design Inc. Check your local listing for showing time! Our Ahh bean bag chair gets it's 15 minutes of fame (again)! See our Martini style on the set of the Family TV awards on the WB network. We all love animals here, so we're happy to say that one of our bean bags will be featured in PETA's holiday auction! We were also a featured merchant in PETA's exclusive Peta Mall! Marriott Starr Pass Resort in Arizona has our bean bags for their hotel's Children's area! Our bean bags are featured in an educational series for kids focusing on the history of westward expansion in the United States. This show, call "Pioneer Life for Children", is a video series that is used in classrooms nationwide! Macy Gray just got 3 more bean bags from us! 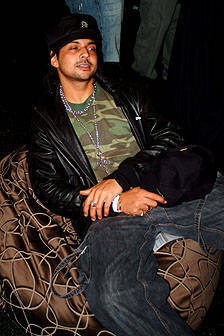 Sean Paul, the dance-hall reggae artist, has our 37" slate bean bag chair. Joe Loeffler, bassist for the hot rock group Chevelle, has a 52" dark olive bean bag from us! Gorgeous actor Jessica Alba, of the popular TV show Dark Angel, ordered a 52" Red Zen bean bag chair! Robert Trujillo, bassist for the all-time favorite Metal Band Metallica, has a 52" purple velvet bean bag! John Travolta & Kelly Preston are getting our powder blue fleece bean bag for their place in Florida! We hear that Kelly was really excited about the one she chose. We LOVE John & Kelly! Whoo hoo! Update: From Kelly's assistant - Hello, Thank you so much for the great bean bag! I wanted to let you know that Kelly received it and she loves it. Thank you so much! -T.F. Tommy Smothers, (yes! from the Smothers Brothers comedy duo), has a 52" blue jean bean bag! Kid Rock, the bad boy Superstar of Rock, has a 52" cocoa velvet bean bag from us! Beautiful Amy Lee, lead singer for Evanescence, has one of our bean bags from the American Music Awards! The hot rock group 3 Doors Down has our bean bag too! Update: Todd Harrell (bass player) just picked the "Uptown" style for his personal bean bag! And, guitarist Chris Henderson got our "Luxurious" style, with plans to get more for a bean bag room! An amazing band with a great sense of style...we love them! Update: Chris just got 6 more! Jimmy Kimmel, of ABC's late night TV show, has a leopard short fur and a terracotta velvet bean bag from us! Lance of INSYNC saw our Martini bean bag on the set of the Familly TV awards and said it would be perfect for his place... he wanted to take it with him! We haven't confirmed yet if he ended up getting it or not. Update: Lance now has a 52" faux suede bean bag. Big news! Our bean bags were featured at the American Music Awards! It has been reported that they were a bit hit with the Stars! Our bean bags were requested to be in celebrities' dressing rooms, in the green room backstage, and also in a showcase room. Plus, we'll be featured in the gift bags celebrities receive from the awards show. Let's hope we get more famous customers to add to our growing list!...Breaking news: Celebrities may be signing one of our bean bags to be auctioned off for charity! Update: our bean bags were a big hit with everyone at the show! The fabulous Macy Gray, music diva, has a 52" orange velvet bean bag! We're proud to say that the Jim Henson Company ordered our bean bag chairs for their screening room! We wonder if Kermit and Miss Piggy are comfy! A famous fashion and home designer (wants to remain nameless) bought "cores" (filled liners) from us for her fabulous New York home...she'll be making her own covers of course! The Smithsonian Institute used our bean bag chairs for their 2003 "Stamps & Stories" exhibit. Kid's Rooms magazine, a Better Homes and Gardens special interest publication, is featuring some of our "Kids at Heart" styles in an upcoming issue! Our Ahh bean bag chair was used in a "Hanes" photoshoot for their new kids' sock line! Watch for it if you're shopping for kid's socks! We loaned an Ahh bean bag chair to Modern Bride Magazine for a Vera Wang photo shoot...How exciting! The sitcom ED called us to order our 52" bean bag chair for an episode! Glamour magazine called about our bean bags for a photo shoot! The Washington Post also used our bean bag for a photo shoot! It was featured in the Home section in an article about how bean bags can help kids with ADD (attention deficit disorder) & ADHD (attention deficit hypersensitivity disorder). Again, our refill saves the day! It was used for a Pepsi east-to-west-coast promotion. We've received word that Clay Aiken, of American Idol fame, has been offered our bean bag as a special gift from his fan club! Our blue denim bean bag will be featured in a "gaming" magazine, along with other "high end" products! See our bean bags in the Denver Art Museum in Colorodo! Plus a huge number of schools, hospitals, and libraries!